Adorable Pup Is Trying To Somersault, But Things Don’t Go As Planned! Have you ever got excited over a trip to the pool as a child? There is something incredibly fun about the water, especially on a hot day when there is no better way to cool off! Just how can you possibly resist those inviting waters – especially when you are a pup who loves to swim? Hotter temperatures are coming about again, so it is time for this family to break out the inflatable wading pool. For this Labrador Retriever, this is wonderful news, and he can’t help but go crazy about it! What an amazing treat he has before him! This adorable pup is, in fact, so excited that he struggles to actually get into the pool. He just runs around and hops in and out of it, unable to actually stay put so he can enjoy the water! At least he is definitely one happy pup – no doubts about that! This Adorable Pup Wants To Show Off To The World How Healthy He Is! 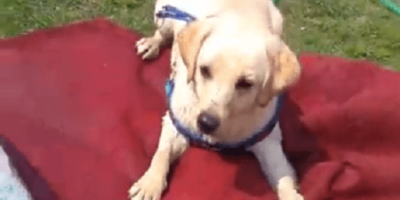 This Adorable Pup Is Having An Absolute Blast Splashing Around In The Water!